Enjoy Utah! : DON'T FORGET: Circus Tickets Winner TOMORROW! DON'T FORGET: Circus Tickets Winner TOMORROW! Don't forget: Tomorrow we will be drawing a winner from those that entered at our Hot Spots location, Gines Auto Service. If you have not stopped by to enter yet, do so today! The winner will be announced tomorrow morning. Read more about the production and how to buy tickets HERE. • Brian Crawford Scott is only the 36th Ringmaster in the 141-year history of Ringling Bros. and Barnum & Bailey®. • Brian auditioned for the coveted role of Ringmaster in 2010 while living in New York City. • Brian received his Bachelor’s degree from the University of Northern Colorado. Brian Crawford Scott was discovered at the New York City audition of the national talent search for the next Ringmaster of The Greatest Show On Earth®. His stunning voice and engaging personality captured the attention of Feld talent scouts. Nicole Feld and Alana Feld agreed that Brian, among the hundreds of hopefuls, had the star quality to become only the 36th Ringmaster in the 141-year history of Ringling Bros. and Barnum & Bailey®. Brian graduated with a degree in Musical Theatre from the University of Northern Colorado and then moved to New York to pursue a career in show business. Less than a year later, while working as a waiter and performing in local productions, a friend told him about Ringmaster auditions for the 141st edition of Ringling Bros.® and encouraged him to try out. He began his research for the audition and discovered the long line of Ringmasters he was to follow. Being a Ringmaster for Ringling Bros. and Barnum & Bailey is more than he could have imagined! He says, “I’m just amazed at the immense amount of talent I see around me. These people are the best at what they do. It’s very inspiring to work with them. I am in awe of the animal performers, too.” Brian’s enormous talent and incredible admiration for these esteemed performers make him a natural and enthusiastic ambassador for The Greatest Show On Earth! Born in San Jose, California, to parents who were in the software tech industry in the San Francisco Bay area, Brian didn’t come from an artistic background. However, his mother likes to remind him how he liked to sing Joni Mitchell while riding in the back seat of the car when he was little. While in high school, a friend asked him if he wanted to audition for the school play. He got a part in the play and discovered that he enjoyed performing. Brian then decided to audition for a musical, Sweet Charity. He did very well and landed a leading role. He loved the theater and decided to continue his studies in Music Theater at college. 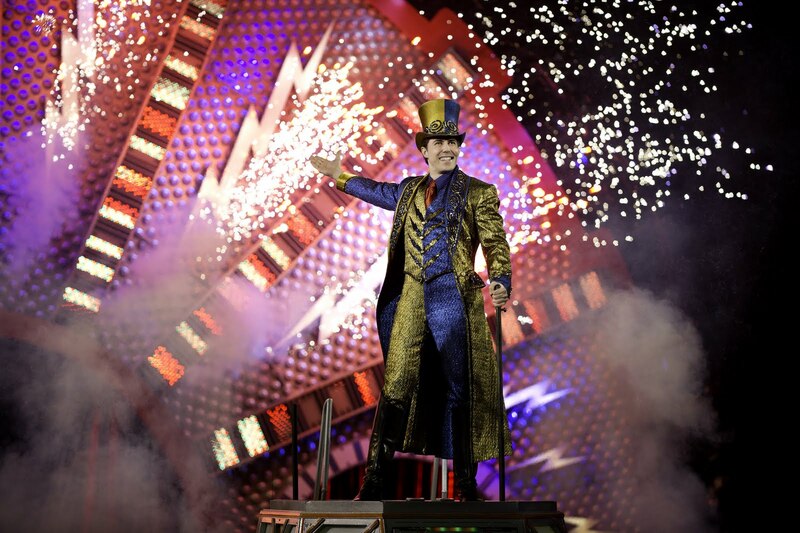 As the new master of ceremonies for Ringling Bros. and Barnum & Bailey ® Presents FULLY CHARGEDSM, Brian Crawford Scott’s bombastic voice will amp the crowd as the rock -n -roll feel of the music gets the audience’s heart pumping. As the allure of the circus continues to dazzle him and he learns the multifaceted world of Ringling Bros. , one of his predecessors gave him some valuable advice: keep a healthy mindset. For Brian, this means working long circus hours in a positive environment. Brian says, “There’s a lot to do and keeping healthy is key.” During the long train rides across America, Brian uses the travel time to recharge his key asset — his voice. In keeping his voice healthy, he also takes care of it by warming it up and not drinking caffeine before performances. Brian’s youthful energy keeps FULLY CHARGED vibrant, while his unique voice brings back the more traditional aspect of a Ringmaster. From being plucked from obscurity to performing for millions of people, Brian’s story recharges the role of Ringmaster for The Greatest Show On Earth®.